Everyone remembers where they were and what they were doing when a member of the great and the good is assassinated. You can kill a politician but their ideas usually live on. They have a life of their own. How much more dangerous, then, the ideas of mathematicians? The announcement of the solution to the traveling salesman problem heralds the imminent destruction of humanity. No more salesman; no more problem. The story begins when a computer programmer is notified by RSS feed that all NP-complete problems lie in P, and thus computer encryption is forever compromised. Knowing the disaster for what it is, he flees, but with this being such a hard-takeoff he might not make it. Stross' ideas are hard, cold, pure, and funny, but it is his storytelling - the effectiveness of the complete tale - that elevates his perspective SF ideas into Science Fiction excellence. This is the kind of fiction I love; thought provoking with shrewdly surprisingly but necessary consequences of the premise. Stross goes from alpha to omega faster than you can guess, and in so doing delivers a solid entry into SF's growing dialogue about The Singularity. Antibodies reminded of Isaac Asimov's similarily elegant short story Living Space. Also refreshing is a humourous conspiracy that explains why Microsoft Windows-based computer viruses are so prevalent. Allan Kaster, who runs the Infinivox wing of Audiotext, has put deep thought into this tale's production. The narrators, Jared Dorek and Shondra Marie, pair up to deliver the action in this first-person perspective masterpiece of SF. Marie reads all the female voices and Dorek all the male. When each speaks the role of the hero and heroine, they do so in an amalgamated accent that is implied by the text. The production is carefully woven with transition music designed to show textual scene transitions and time passing. 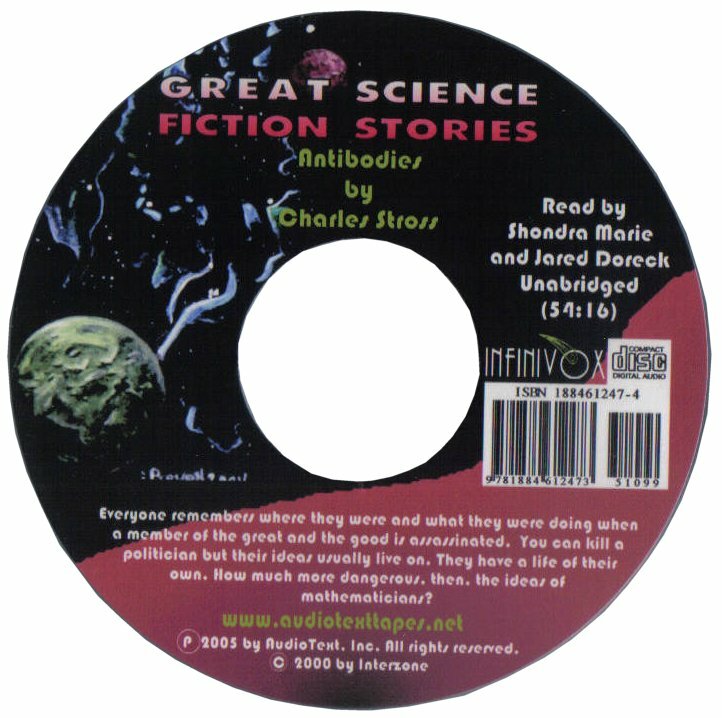 But it is the story that elevates this audiobook to SFFaudio Essential status. With a running time just shy of one hour you aren't likely to have a more quintissential Strossian experience on audio.